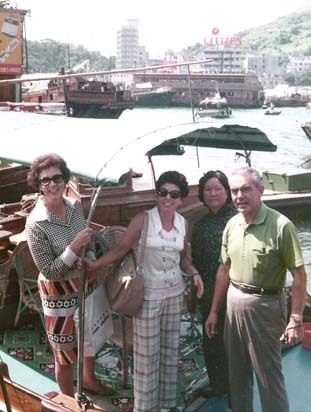 1974 A ten day trip to Taipei is one of the highlights of this year for Mom and Dad. The Taiwanese Government extended an invitation to Luis Gabriel and Cecilia Cano, Director of "El Espectador" and Francisco and Aura Montana, as U.S. correspondents. They met with the Minister of Foreign Affairs, the Director of the International Relations Institute and the Director of the Office of Information. 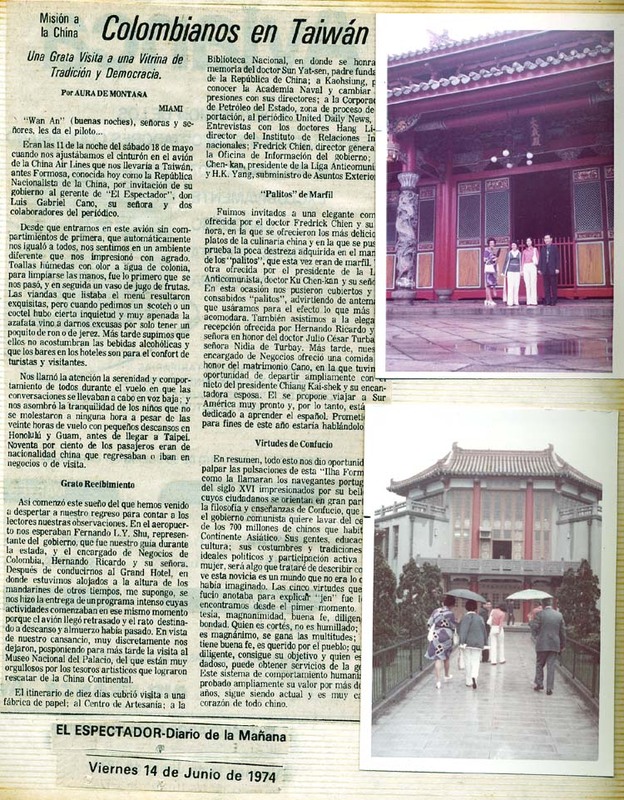 Their itinerary also included visits to the National Palace Museum and National Library. They traveled to a few nearby towns where they toured the Naval Academy, State Petroleum Corp. and a paper factory. Also they were delighted to meet the teachers and a few of the students at an elementary school. There were elegant receptions and dinners, and they also participated in a courtly Chinese dance. Shortly after their return, Mom penned three articles of their wonderful experiences, which appeared in the "El Espectador." 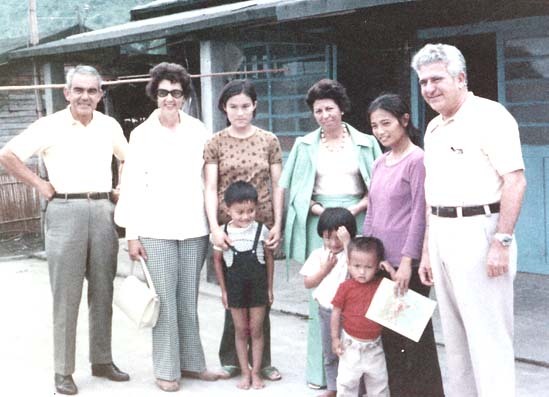 She wrote how impressed they were with the industrious Taiwanese culture, but especially with the courtesy and thoughtfulness of the people, young and old. 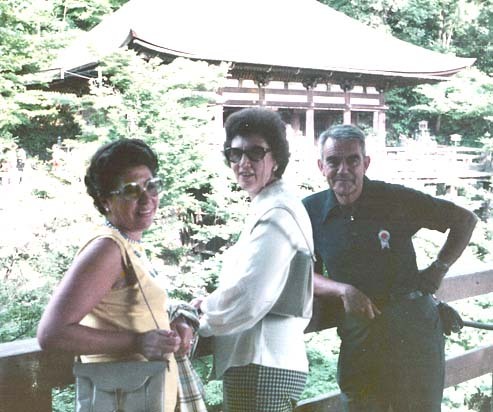 1974 Luis Gabriel Cano, Mom and Dad enjoying the beauty of the landscape and architecture. 1974 Another view, with Cecilia Cano. 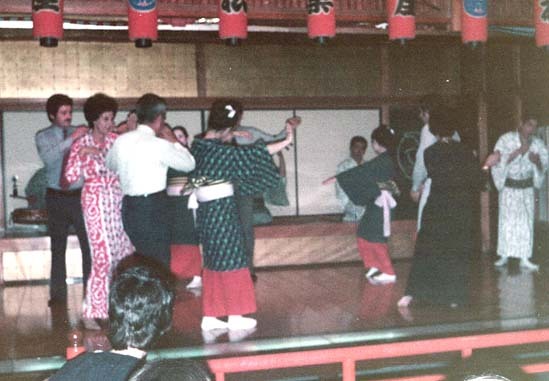 1974 Mom, in pink outfit and Dad in white shirt with his back to the camera, try out a few dance steps. 1974 A meeting in the office of one of the Taiwanese officials. 1974 Visiting an elementary school in the countryside. 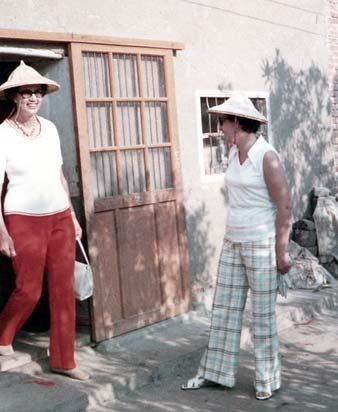 1974 Mom and Cecilia step out wearing the traditional headwear. 1974 An article from the "El Espectador" penned by Aura about their experiences. The travelers in front of an ancient palace. 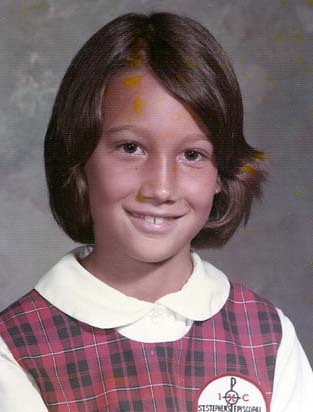 1974 Lauren, at 9, in another school picture at St. Stephen's Episcopal Day School. 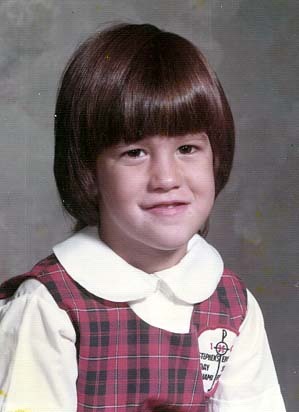 1974 Lisa is now 7 years old in this picture. 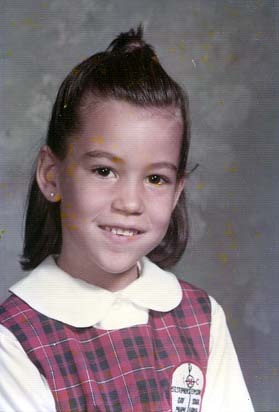 1974 Carolyn, age 4, and so cute in her uniform. 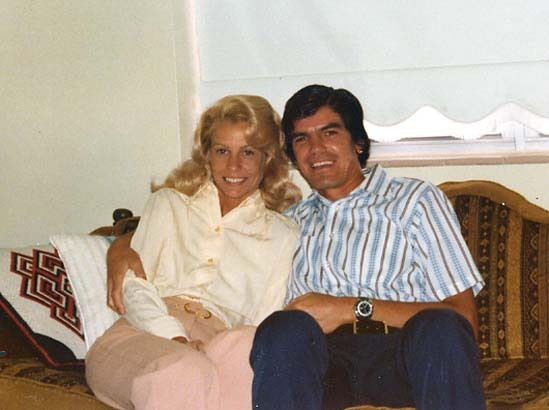 1975 Happy couple Mauricio and Valerie Fish are engaged! 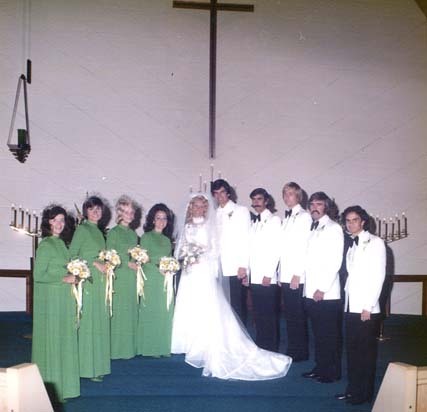 1975 The bride and groom with their wedding party . The celebration took place on October 11 at St. Paul's Lutheran Church in Boca Raton. 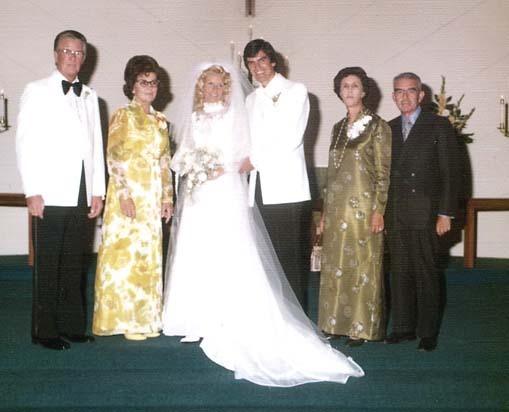 1975 The bride and groom's parents after the ceremony. 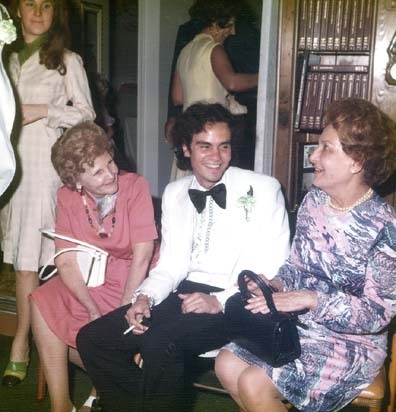 1975 Danny entertains Gussie Woodard and Esther Atkins at the reception, which took place at the home of the bride's parents, Richard and Betty Fish. 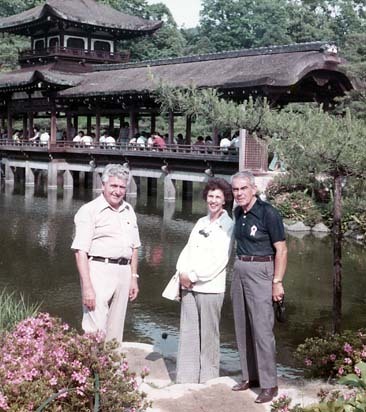 Gussie and Esther were lifelong friends and joined Mom and Dad on several of their European trips. 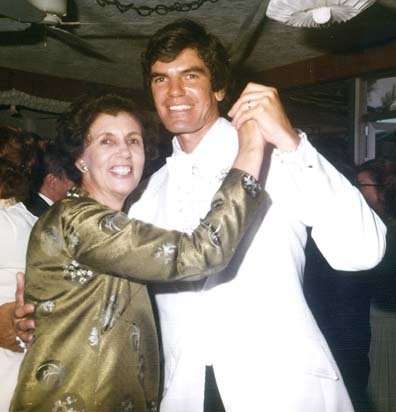 1975 The groom and his Mom, dance a slow waltz during the festivities. 1975 Kiko looks after younger brother, Pablo, as he tries to make a swift getaway from the group of cousins. Pablo's birthday is Sept. 7, 1974. 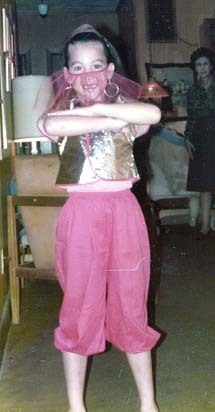 1975 Lisa, as an Arabian princess/belly dancer, visits Mimi, standing in the background. Happy Halloween! 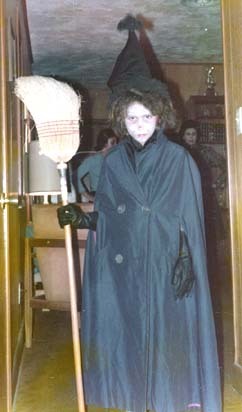 1975 Lauren, the most wicked witch of the west...or at least trying to look that way. 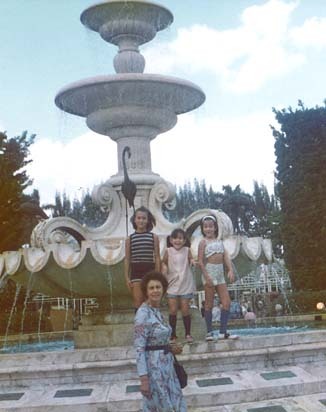 1975 Mimi and three of the granddaughters in front of the Granada Fountain on Granada Blvd. in Coral Gables. This fountain would sometimes turn into a suds extravaganza, courtesy of various children in the neighborhood. The suds would spill out of the pool and into the street. The Spanish design and tile work add to the beauty of this fountain. The street names inscribed on corner markers made of coral rock, are all in Spanish. 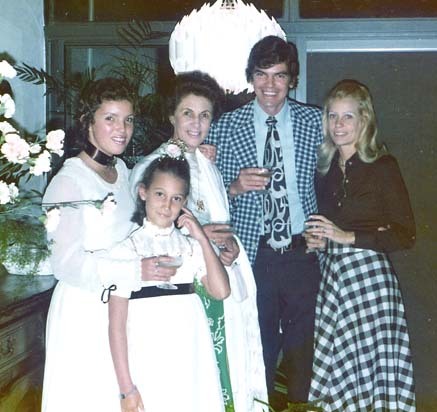 1975 Cousin Myrianne, (far left) U. Hector's daughter, lived in our home at 907, during two of her high school years. Lauren, Mom, Mauricio and Valerie are dressed to the nines. 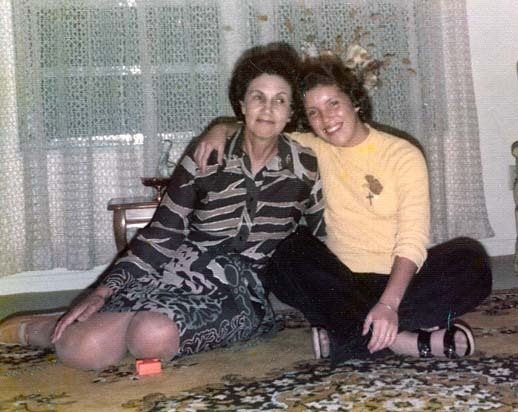 1975 Mom enjoyed Myrianne's company, as most of the older children were away at college. 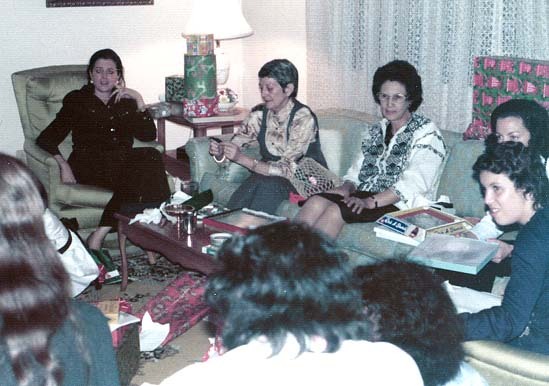 1975 Carmen Silva, Rosario's Mom, and sitting in between Rosario and Mom, visits the crew on Valencia Avenue. 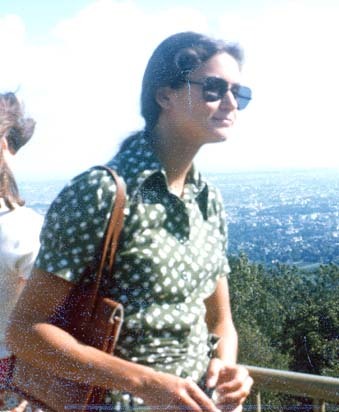 1975 Constanza taking in a highbrow view of Warsaw. She accompanied Mom and Dad on an Eastern Discovery tour of Moscow, Leningrad, Warsaw, Bucharest, Budapest, Vienna, Prague and East/West Berlin, all in 5 days, but more like 22. Lucky! 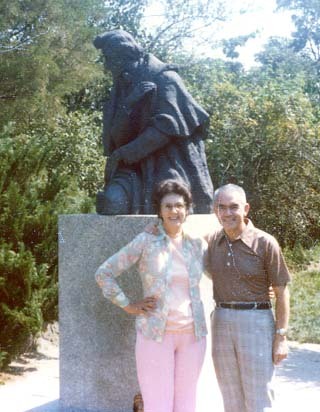 1975 A handsome couple visit Zelazowa Wola, Chopin's birthplace, a short drive from Warsaw. 1976 More travelin'.... 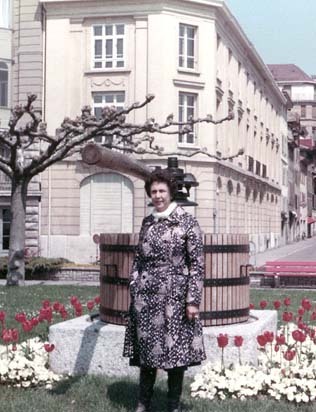 Early spring in Switzerland brings out pretty flowers for Mom and Dad to enjoy. 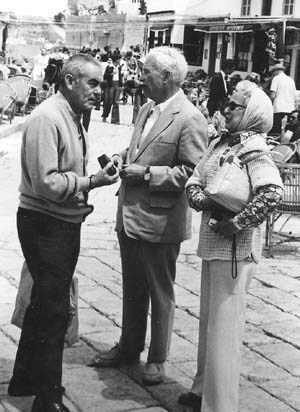 1976 Dad in Germany, with two of his fellow travelers, discuss all the great sights of the trip.